The Macallan Distillery is on an estate spreading over 390 acres, bordered to the south and east by the river Spey. A beautifully managed property, Macallan's Whisky producing staff share their land with sheep and highland cattle. At the center of the estate is the Easter Elchies House, a highland manor built over three hundred years ago. The Macallan Distillery was founded in 1824, but not as The Macallan. Alexander Reid, a farmer and teacher, founded Elchies Distillery with a newly obtained distilling license. Whisky may have been produced on the site in unlicensed fashion, like many others prior to the Excise Act of 1823. Roderick Kemp bought Elchies in 1892, changing its name to Macallan-Glenlivet, beginning an era of prosperity that The Macallan continues to enjoy. Highland Distillers acquired The Macallan in 1996, and were, in turn, taken over by the private equity Edrington Group in 1999. Recently, construction for a new distillery was approved and, once open in 2017, it will make Macallan the single largest producer of malt Whisky. The Macallan distillery prides itself on the care with which it selects, maintains, and curates its casks. Their warehouses contain more than 170,000 casks, a majority being Spanish Sherry of European oak, but with many ex-Bourbon and American oak Sherry casks in the mix as well. At last report, 25 staff are employed full time, just to oversee the maturation of Macallan's stores. Macallan is also known for its uniquely small spirit stills. At a capacity of 3,900 liters each they are some of the smallest in the industry, concentrating the alcohol extracted in the wash with high contact, for a fruity, rich new make. What does Macallan taste like? The Flavor Spiral™ shows the most common flavours that you'll taste in Macallan Scotch. It's based on all Macallan drinks in our large database and gives you a chance to taste Macallan before actually tasting it. Macallan is a popular choice among the younger Whisky drinking crowd and they do a lot of marketing activities to keep in touch with them. In 2016, they created a Facebook chatbot that answered questions about the brand and its Whiskies. It's unknown where the Macallan name comes from, but there are a few possibilities circling around. The most popular one is that it comes from two words in the Gallic language. “Magh” which refers to a fertile piece of ground and “Eilean” which curiously enough means, “of Saint Fillans.” Over time “Magh Eilean” became Anglicised as Macallan. The Macallan Speyside estate is the only distillery ground in Scotland where you can fish for atlantic salmon. 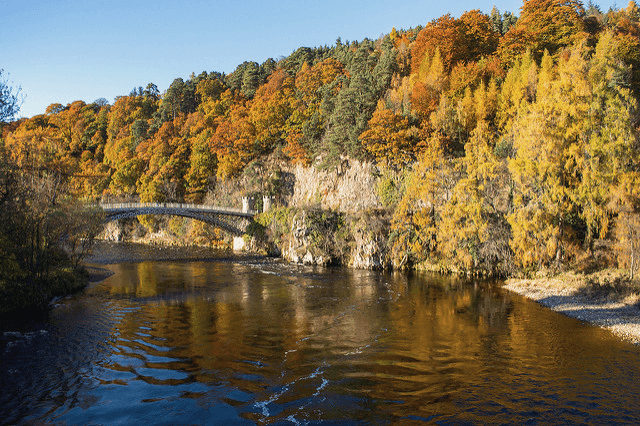 It sits right on the River Spey and from February to September is the perfect location for some salmon fishing. David: Hi, my name is David Cox [SP], and I'd like to welcome you to the home of the Macallan. We've been here since 1824 when we were founded by Alexander Reid, a barley farmer. Female: We are sitting in a house, which is, the spiritual home of the Macallan brand. We welcome people from all around the world. David: We are, in fact, one of the oldest distilleries in Scotland and the fame and the reputation of the Macallan has been founded from the very start on the quality of our wonderful, fine, single malt Whisky. Bob: I'm Whisky maker for Macallan, welcoming you to our site. Male: Bringing Whisky together can be fun, it can be frustrating. But hugely rewarding when it works. David: I'm sitting here in one of our oldest warehouses surrounded by these wonderful Spanish oak Sherry-seasoned casks. And they're all breathing in this wonderful, soft, moist air here on Speyside. Jim: My name is Jim Cotto [SP]. I've worked at Macallan for 13 years. Favorite part of the job is probably seeing a vat coming out or a special bottle and thinking, "Well, I've been involved in that." Male: We're standing at the sample safe which collects all the new mixed spirits which goes forward for maturation. The whole idea of the small still is you can produce a nice, heavy, oily flavor within a new mixed spirit. David: One of the great things about the Macallan is that we're able to mature our single malt for an extraordinarily long time. Some of our oldest Whiskys go up to 40, 50, even 64 years old. Male: It's a bit like cooking at a nice, slow speed, whereas you're enhancing the flavors. It's exactly the same in the distillation process because we are looking for the best of the best. Female: This truly is a living, working estate. We have fields set aside where we plant our own strain of barley. We have one-and-a-half miles of fishing beat. We also have our own herd of Highland cattle here. All these things go together to make Macallan really quite unique. Bob: It's still very much a family atmosphere and everybody knows everybody and it's good banter. And we look after each other as well. Gary: I'm Gary Logan, the [inaudible 00:02:55] supervisor at Macallan. I've been here since school. So it's been awhile. Female: The thing that I enjoy most about this job is the variety. I meet the most amazing people and life is never dull here. Male: Been at Macallan since 1984. Started as a warehouser, worked through the production process and forced [inaudible 00:03:19] here. Willie: My name's Willie Bremer [SP]. I'm the ghillie for the Macallan Estate and the wonderful people who work for...I love doing it. Male: [inaudible 00:03:29] and was just approached, would you like to be assessed as far as nosing goes? And it just happened to be that I did fairly well in the assessment. Willie: My job is looking after the fishes, count the fish in the river here. The river Spey is world famous. People queue up to come and fish the river here. Female: The people are all great characters, all very passionate about what they are doing and focused on what the end result should be. Male: Thirty percent of your flavor comes from your new spirit, and also there's the aging process, which softens, makes your Whisky more mellow where you're getting a continual change as far as the Whisky working within the cask. Male: Today we're [inaudible 00:04:18] re-well, see us filling the cask behind us, and that will be in the warehouse for 10-12 years before it's ready to be bottled. Male: The wood is probably one of the biggest factors in making the Whisky. I mean, 60% of the flavor comes from the wood. American Oak is totally different from Spanish Oak. David: We invest huge amounts in sourcing the very best quality oak from the north of Spain and from North America because we know that our oak casks are the single biggest contributor to the final aroma and flavor of the Macallan. Bob: Sherry Oak gives the most wonderful colors to some of the Macallan Whiskys, from amber colors, to gold, to the rich, dark, rustic, deep mahogany colors. And we typically get aromas and tastes of dried fruits, of spices and chocolate orange. It's a wonderfully rich, dark, lusher style of single malt Whisky. Willie: To me it's a lovely place. Look around you. Lovely scenery. What more can you want from that? Gary: Everybody likes Macallan. Everyone, they see the Macallan badge, they just flock round you. Male: [inaudible 00:05:36] as much more to do. [inaudible 00:05:40] enjoy the peace and quiet so we can have a Whisky together. Female: The Macallan is this fantastic, wonderful, single-malt Whisky. Bob: So it's nice to work for something to be proud of and also to work for something you understood as well, because I do like a dram.